The Gardner Flatwork Feed Conveyor is designed to increase the efficiency of operators feeding flatwork ironers. 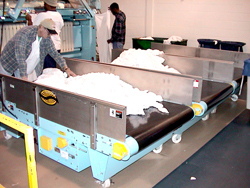 The large bed on this conveyor is loaded by slings from the washroom, allowing the flatwork to be spread, and preventing the operators from having to pull and tug the flatwork items which are compressed in a basket. A photo electric eye control automatically advances the conveyor and its contents for easy access for the operators.